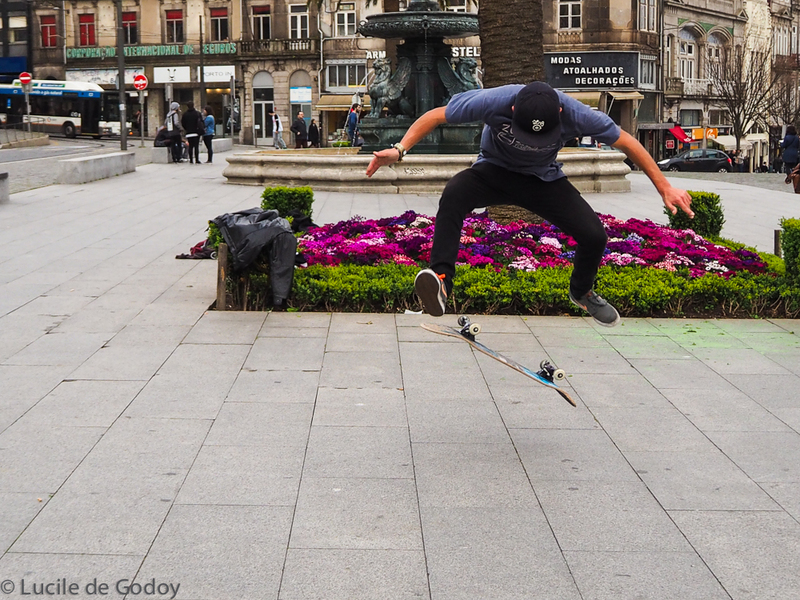 While walking around the streets of Porto in Portugal, I saw a group of students practicing skate jumps in front of their university. I am not experienced with playing with the shutter speed, and hoped to shoot not only blurry photos. These may not be very sharp but they surely can represent my interpretation of an ephemeral moment, which is the prompt for WP Weekly Photo Challenge: Ephemeral. Ephemeral: adjective – Lasting for a very short time. Not only these are fleeting moments but the time to do that may perhaps be reduced when they leave uni and join the workforce. I hope for them to never lose their playful, curious, and adventurous spirit, and that they bring it as an essential part of their lifestyle, no matter what they become as future professionals. 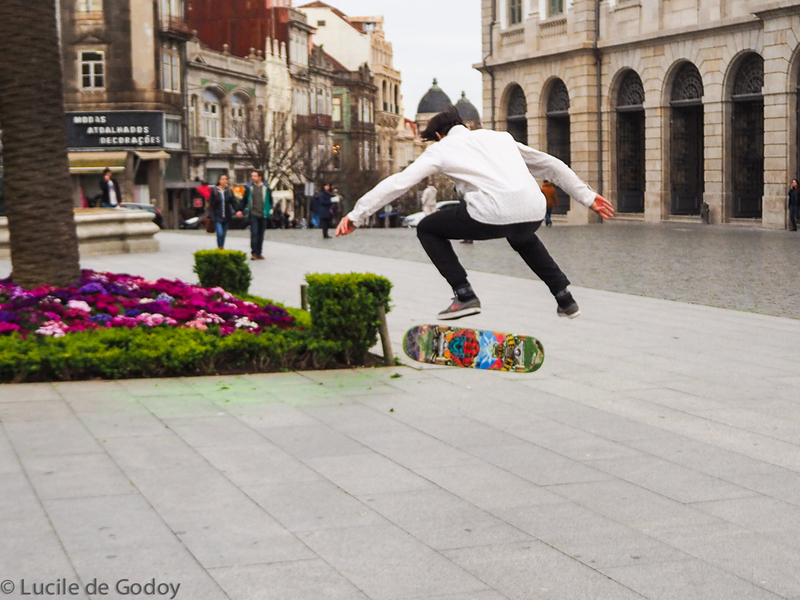 I could be wrong but they don’t exactly fit the Portuguese university student stereotype … Great pictures! Well, as a tourist, I bought what I saw . They were in front of the university of Porto, had bags and books and some just came from inside the uni. There were many foreigners there as visiting students, so you have a point here. Thanks for bringing this up. Reality is not always what we see. Thanks also for visiting and commenting. Indeed that is not important – I’m sorry if I was rude or something like that! Please don’t think like that. You’re neither of these. I liked your observation as it adds layers of reality to my story telling. Thank you! You are too kind, Andy. They are not exactly sharp and the post processing didn’t improve it so much. Thank you for being so generous and supportive. These kind of pictures don’t need to be too sharp, and anyway, I think sharpness is too often a goal sought at the expense of art, so I love these! They surely were more talented and self assured than the enthusiastic photographer…I was running after them from one side of the square to the other, and shooting like mad, at a fixed speed after I made the first and checked that it could perhaps work. I enjoyed doing it though. Thanks, DJ! Lol Can be I a ninja photographer too? Thiese are very good photos… You have suspended their action in the exact moment. It is truly an “ephemeral” timing. I “super like” this photo set! Thank you very much for dropping by and for your encouraging comment. Much appreciated! Love the action and the story hinting at not only the movement but also their future. Hi Julia, thanks for visiting the blog, as well for your lovely and supportive comment. Great shots! I think you did fantastic for someone who doesn’t have much experience with shutter speed. I don’t see blur at all. They are perfect for the “ephemeral” prompt. Amy, you’re so supportive and encouraging! Thanks for that. I got carried away with the opportunity and quite liked doing it not knowing what the outcome would be. I am glad I didn’t blur it all! Thank you! I think they are not blurry at all. These shots are great! Wow! You definitely captured these guys in flight! 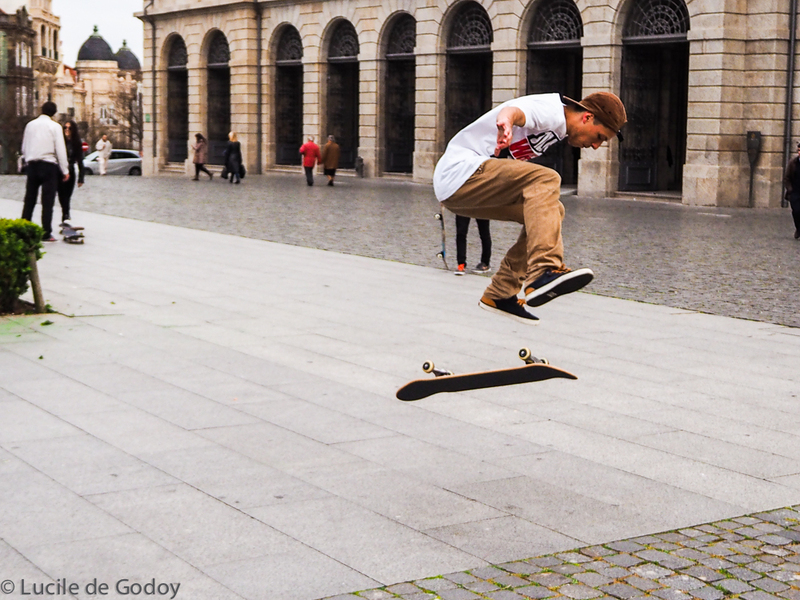 Perfect… Ephemeral indeed… I always wonder how they’re able to perform these skateboarding tricks! I did get them flying and was amazed with their skills. I wish the best shots of their flights had not been blurred! I guess it is a mix of boldness and practice that makes them perfect that art! Indeed they are bold and fearless! You helped to show that to your viewers via the photos! These are cool shots! 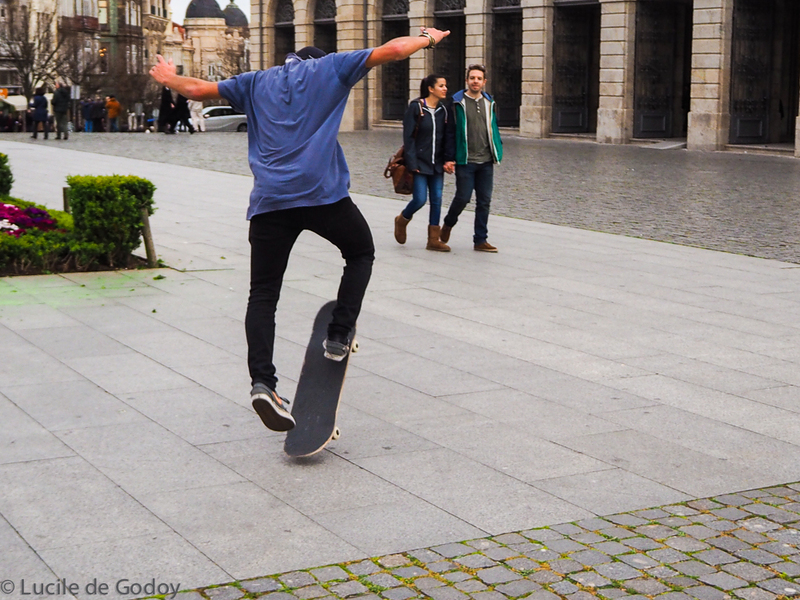 Not only the skateboarders, but also their boards are caught in mid air! Nice, Lucile. Hi Lois, I’m very glad you liked my first attempt. Thanks! OMG – Fabulous shots Lucile! I am having street photography envy! LOVE! LOL. That is ok, Lisa. If it is coming from you, it is most welcome, as it is quite a compliment! Thank you! Lol for a second I thought you meant skateboarding…why not? Some fell a lot and didn’t break anything. So we can try too! 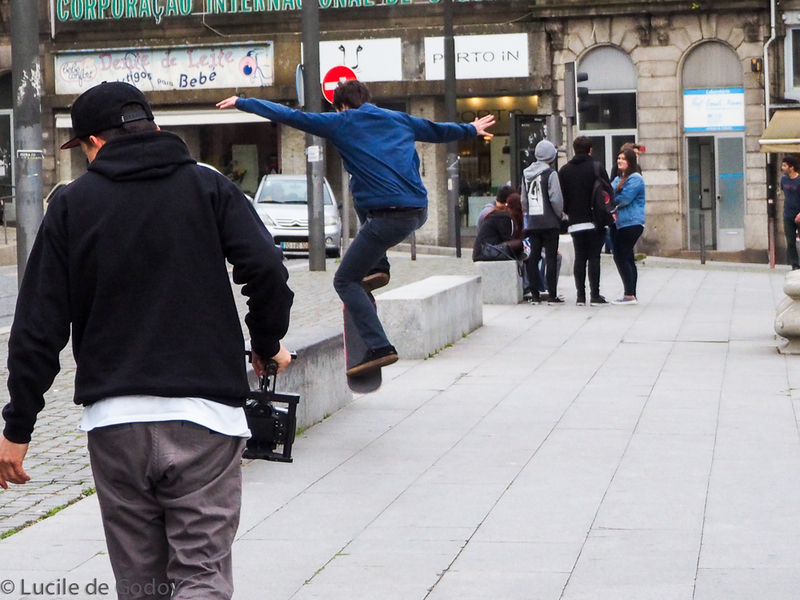 Isn’t Porto a small lovely place? GREAT captures! The second one with his feet on the board is way cool! Hi Terri!! Thank you so much. I was lucky that it didn’t turn all blurred!! Lol I was shooting non-stop. Great action shots and perfect for this challenge. Thank you so much for visiting Helen. I’m grateful for your comment. Wow. Then you’re really a pro by now in photographing his moves! I had never done it before and had failed miserably trying to shoot birds. 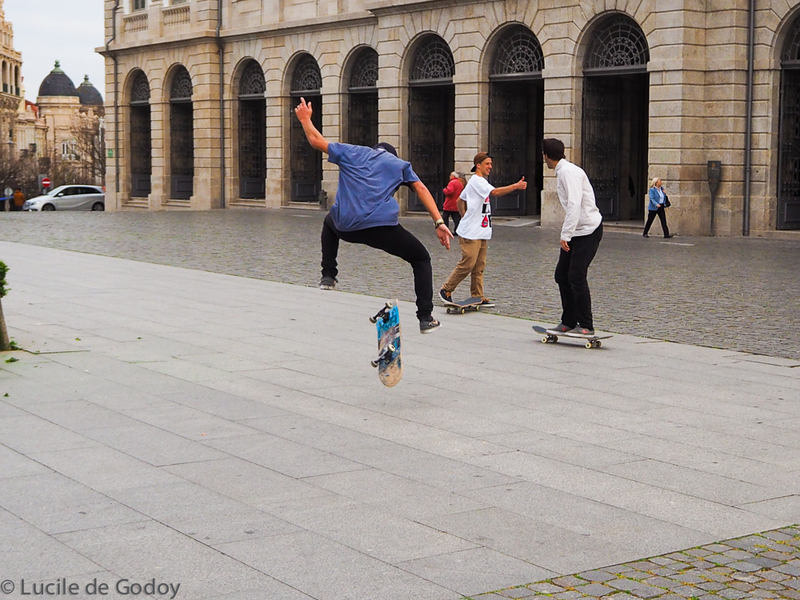 Besides, it was a very cloudy day, but I decided to try it anyways, as the sight of those guys and their skateboards was not to be missed. Funny to hear how you did it. I shot endlessly, following their moves and hoping that some would work. Eventually some became ok and not a shame but hey, I have nothing to lose but learn, and just gained a bit of experience with action photos. Thanks for commenting. Really appreciated it. Cool pictures. Are these the action photos you were mentioning? I wonder what is the Portuguese university student stereotype? I’m glad you did not only take photos of culture, but of life too 🙂 These are perfect, Lucile. I am under the impression that their dress code is very formal. Is hot some girls singing at the central station and they wore suits.